It all started when I was one of a handful of female students in the Global Mining Management Program at the Schulich School of Business in Toronto, Canada. Being sociable and curious about people by nature, I immersed myself in the mining community and met many motivating and inspiring leaders. At the same time, however, I couldn’t help but notice that many women in the early stages of their mining careers shared a feeling of disconnect from leaders and even their peers. Inspired by the likes of Pat Dillon, President & CEO of Mining Matters, Anna Tudela, VP Diversity of Goldcorp and Maureen Jensen, Chair and CEO of the Ontario Securities Commission, I realized that I could play a role in empowering and connecting women within the mining industry. And so Women Who Rock (WWR) was born. In five years, the incredible growth of our team and what we have accomplished are beyond my wildest expectations. What started as an idea with a handful of volunteers has expanded to an organization with an advisory committee of six mining leaders and an executive team of eight professionals, all whole-heartedly committed to their roles and responsibilities. And like any start-up with new ideas and a solid business plan, getting buy-in was challenging! Today, the commitment from our partners and sponsors is truly amazing. We have definitely broken through the glass ceiling and I couldn’t be prouder of what we have achieved, together. Elena Mayer President & CEO Women Who Rock. Women Who Rock strives to be a key stakeholder and spearhead innovative changes that improve the image of our industry, ignite curiosity about it, and connect aspiring women to leaders in the sector. Women Who Rock is committed to empowering women and to improving gender diversity in the mining industry. It aspires to be an integral part of positive change and leadership. Through the success of our Auction for Action program, now in year five, we have created mentorship relationships by connecting aspiring women to mining leaders. Among the mentees are women completing graduate studies and also in the early stages of their careers in geology, engineering, law and business disciplines. Women mentees have the potential to take their careers to the next level through a one-on-one mentorship meeting with a mining leader. We take an active role in generating and promoting positive stories about the sector both inside and outside of the mining community. All with the goal to improve the industry’s image and to ignite curiosity. We strive to impress and engage in all conversations about career opportunities in mining while attracting more women to the industry’s ranks. With a knack for developing out of the box ideas and events, we bring diverse groups with common goals together. In fact, we have become the go-to liaison between stakeholders, addressing common challenges and sharing success stories. 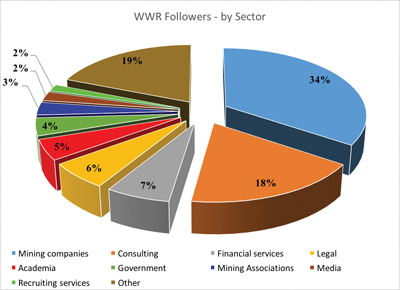 Since 2014, WWR has grown into a well-known and respected organization, within the mining industry, with more than 800 active and diverse followers in Canada.